This morning, Israel woke up angry. We have every right to be angry. 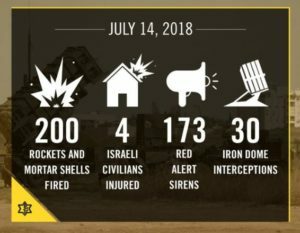 Over our short weekend, our country was hit by nearly 200 rockets, missiles and mortars. Four people were injured; three of them in their own home. A playground was filled with the black smoke of an explosion. Really, a playground. And, a rocket landed very close to a synagogue. A synagogue. And, of course, there was the home. A father heard the powerful explosion as the missile slammed into his backyard. From his hospital bed, he explains to the reporter that his wife had just left the room that exploded before his eyes. She was injured, but gratefully, less than he was. His two daughters, aged 14 and 15 were also hurt in the explosion. He had not yet had a chance to see them because the doctors were still taking care of them. A home. Israel is angry this morning, and sadly, we are doing what we normally do when this happens. Normally. Because after decades of these incessant rocket attacks, too much of the country has become immune. The media is so used to these attacks, it takes blood or shock to even get a mention. Blood we have this time; perhaps the rocket hitting near the synagogue and playground may deliver the shock. But blood and shock don’t lessen the fact that Israelis are demanding that the government do something. We are not stupid enough to expect a world reaction and we are too angry to care. What would you have us do? And, after all, they are suffering on the other side of the border. These are the words of the left. They reek of the ghettos of Europe and the Arab countries out of which Israel was born. In anger, we now respond. There are many things one of the strongest armies in the world can do. As to the suffering on the other side, we are not responsible? One, did WE cause the suffering? 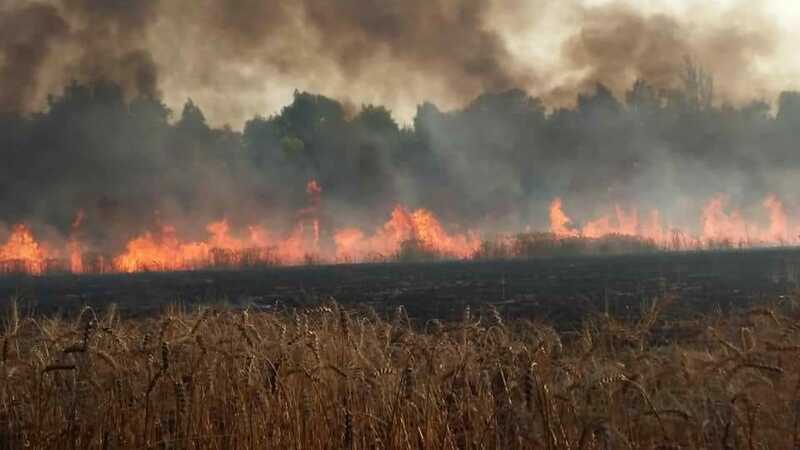 If they lack food, it is because they stop the trucks filled with food and because they looted, burned, and destroyed generations of hot houses (more than 3000 of them) that were successfully growing huge amounts of crops until the Palestinians themselves set them afire. And then, if they lack fruit, it is because Hamas stopped fruit imports. If they lack tires, it is because Israel stopped allowing them in, after Palestinians set afire tens of thousands of tires. And the harder question to tolerate on this day of anger is “what would you have us do?” We have one of the strongest armies in the world. Will be be defeated by kites and condom balloons from Gaza? Our fields, tens of thousands of dunams, have been burned to the ground. Yes, we will replant them but that does not lessen the harm felt by hundreds of thousands of Israelis. Can a nation that can shoot missiles out of the sky surrender to condoms and kites? No, it isn’t pride and it isn’t humiliation, it is our human right to be safe in our homes and in our land. “But we blockade their borders!” Cries the left. What else can these poor Palestinians do? Blockade? Image a person on an escalator and the escalator breaks. Is that person stuck? The Egyptians have controlled the Rafiah Crossing for more than a decade. Through that crossing, Palestinians can enter and exit Gaza through Egypt. Or they could, if the Egyptians allowed it. Instead, for over two years now, the Egyptians have only allowed it to be opened for a few days or hours at a time. 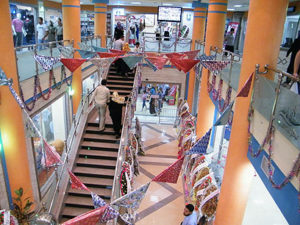 Just as the man in the YouTube video isn’t really “stuck” on the escalator, Gazans aren’t “stuck” in Gaza. If the “front” door won’t open, but you have a back door, it is absurd to say you are stuck, blockaded. Just open the damn door (to Egypt) and get what you need there. As for Israel. Perhaps, we need to close the damn door…and built a wall. Maybe even a mile high. Yes, that is the anger talking and today, we are allowed. TWO HUNDRED ROCKETS. What sane country would allow such an attack. Today, Israel is angry. More, today, as is true every day for the last 70 years, we are a nation at war. The only problem is that we aren’t taking this seriously enough. We are allowing them to send balloons and kites to decimate our land; and rockets to destroy our homes, synagogues and playgrounds. Pathetically, we are the ones often accused of a disproportional response to Gazan attacks. Fine. Let’s do a proportional one. For every missile they fire at our cities, intentionally targeting our civilians, let us fire one rocket back. But, says our culture, we don’t want to level an apartment building and kill hundreds of civilians? Fine. I accept that. But we can announce that we are about to bomb their malls. We can even drop leaflets to tell them which one…you have 10 minutes to evacuate…hey, we’ll even give you another. Then we fire one warning shot…and then we destroy it. Another missile? Okay, so we hit another mall. Or, maybe a theater. Ironically, I would even have suggested they target the Crazy Water Park in Gaza that was built in May, 2010 and cost over $20 million to construct. Three gorgeous pools, a 100 meter canal. Definitely, an acceptable target, except Hamas militants burned the place to the ground just four months after it was built. Now there’s a people who know how to channel anger! What do we do? We target empty buildings, we agree to ceasefires while they continue to fire at us. And still, we watch our land burn and our wives and children cower in fear while we fail to protect them. Even one from an angry Israel.